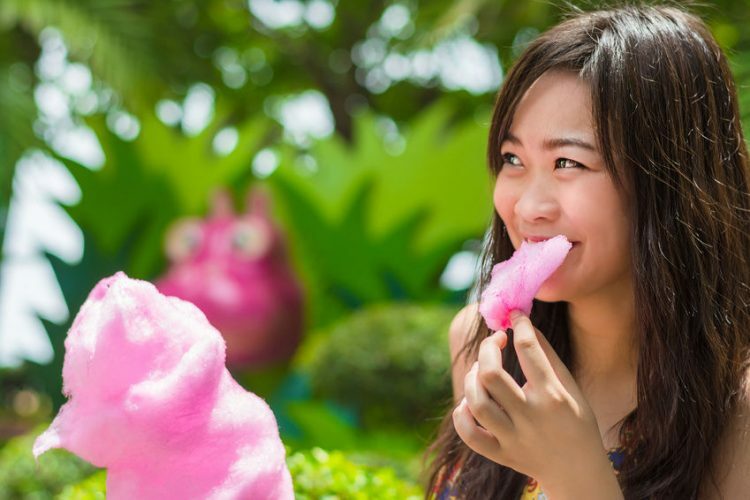 How many times have you taken the kids to a carnival and enjoyed eating cotton candy? Have you ever wondered how to make it?The process is simple with cotton candy makers. This machine spins the sugar into a web and sticks to a stick. The great thing is you can now make your own candyfloss at home. This allows you to control the flavors and the ingredients used. We have selected some of the best cotton candy makers machines offering versatility in making more than just fairy floss. Some of these machines can make cinnamon-flavored, sour, and sugar-free to spicy cotton candy. The great thing is you can use the fairy floss as a garnish in drinks and desserts. Once you have mastered the skill of making cotton candy the uses are endless. 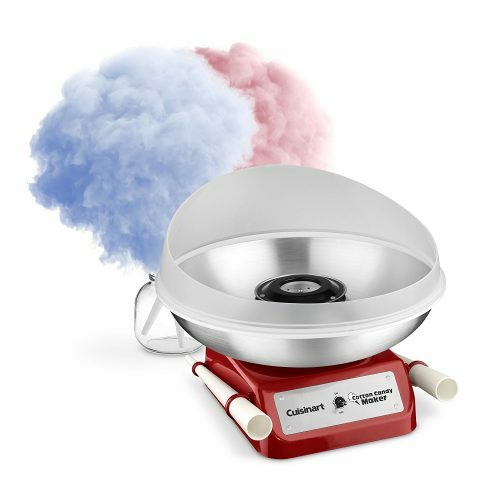 To create fluffy spun sugar fairy cotton at home, you need the CCM-10 Candy Floss Machine by Cuisinart. The appliance has a red carnival color. Whether you want to make an interesting garnish for cupcakes or just want to entertain the kids at a birthday party the CCM-10 is ideal. Cleaning: The parts detach making it easier to clean. The PCM805RETRORED is a cotton candy maker that makes retro hard and sugar-free fairy floss. Make delicious treats for your kids as it works with flossing sugar as well. You can buy the Nostalgia Cotton Candy Kits separately or use what you have available in your home. 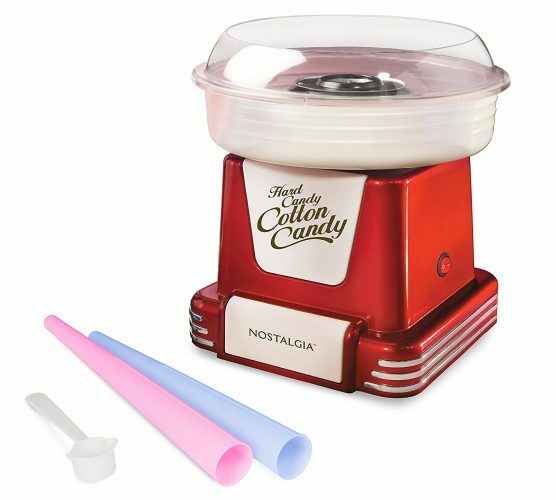 Transform delicious hard candy or even sugar into fluffy candyfloss with the PCM305 Vintage cotton candy maker model. View the process through the transparent rim guard and disassemble it for ease of cleaning. This is a powerful model with a 450-watt motor. 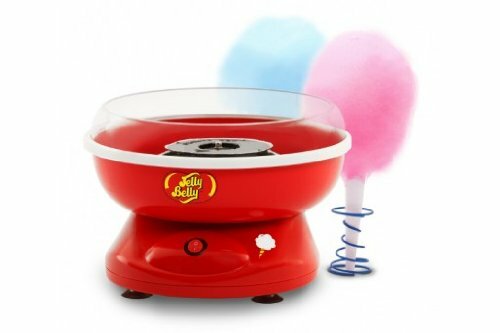 The Jelly Belly is a compact sized candyfloss machine and great for those small spaces in the kitchen. If you need to make occasional cotton candy this appliance is perfect and fitted with six disposable cones. 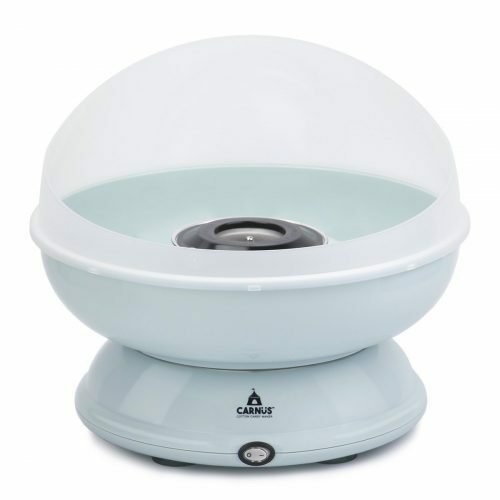 The Carnϋs is a fun appliance to use at home and one of the best cotton candy makers. The blue color stands out in the kitchen and looks great when used at birthday parties. The unit is easy to use and clean as the parts come apart. Use it with different brands of floss sugar kits. The shield prevents fairy floss from flying around. 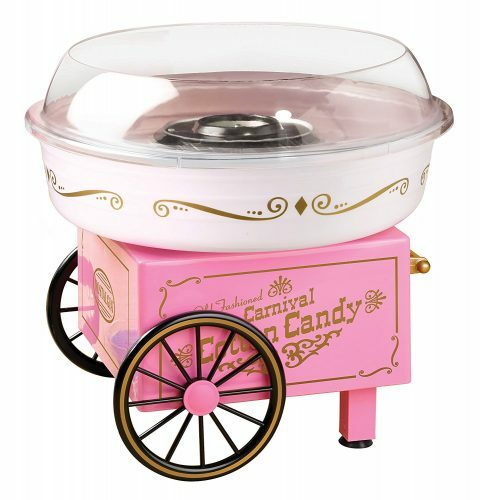 The Candery is a bright and colorful styled fairy floss machine. 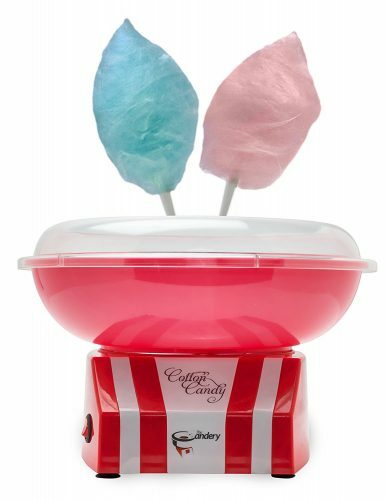 You can use hard candy to flavored sugar in these cotton candy makers. Whether you are hosting a birthday party or have kids over for a sleepover treat them to some candyfloss and get the party going. The Waring Pro CC150 has a built-in guard preventing candyfloss from flying around the room. Included you receive two reusable cones with storage spots on the base. The hub detaches from the base for ease of cleaning and powered by a 350-watt Halogen motor. 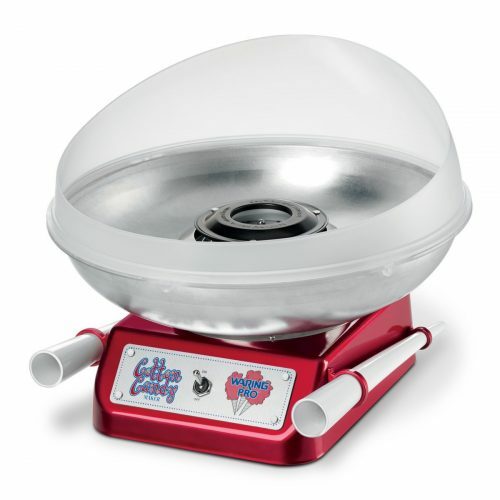 For a more expensive cotton candy maker choose the Nostalgia CCM200 model. This is another Vintage styled appliance you can make hard & sugar-free candy cotton. The unit has a pull cart and works well with any cotton candy kits. 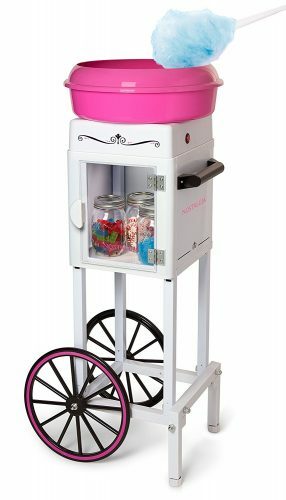 Design: Adorable design with an 11-inch spiked wheel cart with pull handle and has a compartment to keep your cotton candy supplies. The top separates from the cart to use on a tabletop. The Olde Midway commercial fairy floss machine is not cheap, but offers you outstanding performance. The appliance has a large bowl made of stainless steel with a high-powered motor and three-bin storage drawer. Furthermore, these cotton candy makers have a heating element and most of the parts detachable for cleaning. 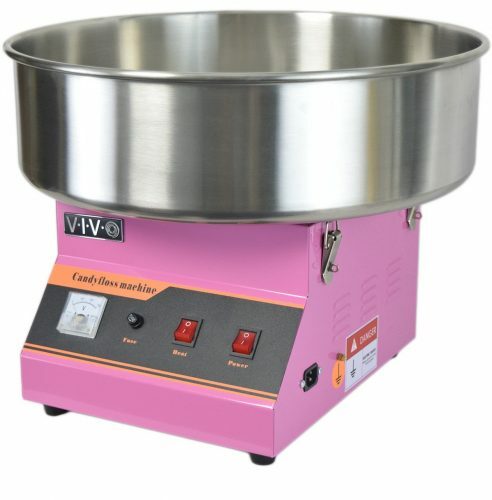 If you prefer investing in a commercial candyfloss maker, the VIVO CANDY-V001 is the one to buy. This appliance puts out two to three servings of delicious fairy floss per minute. The great thing is these cotton candy makers are not limited to using only granule sugar, but can melt hard candies to dish up some great sweet treats. 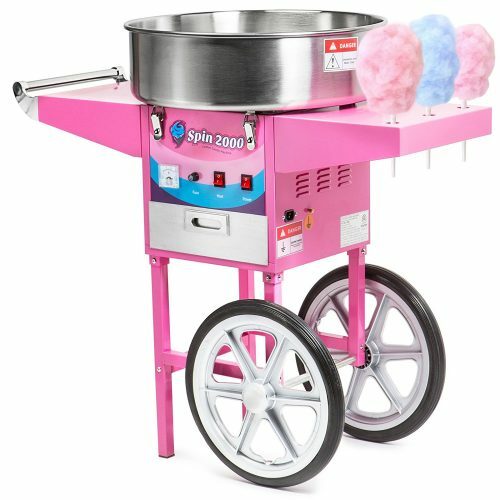 Whether you need a commercial or home candyfloss machine, we have the best cotton candy makers in 2019 right here. Liven up your next event and spread out some candyfloss to sparkling fairy floss cupcakes to keep your guests talking for hours. They are fun, so go back to your childhood and try out one of these appliances when hosting your next event.